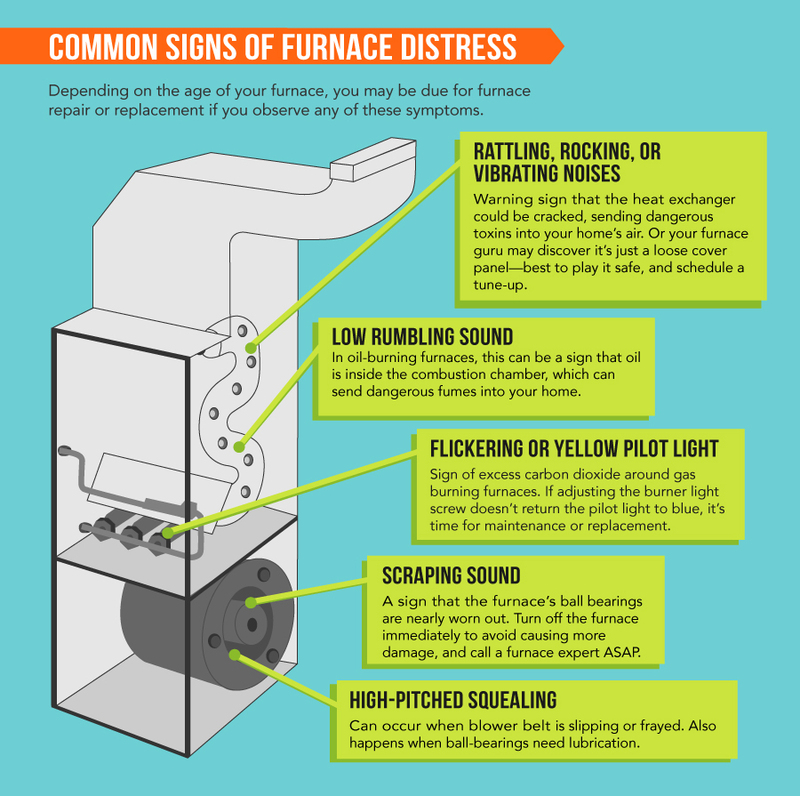 It’s common for furnaces to make noises, such as the hum you hear as it operates. Pay attention to unfamiliar sounds as they could be a sign that the heating system needs a repair. Loose inducer: Oil-powered furnaces use a motor-powered fan, or inducer, to push out smoke and fumes. The fan might make a clicking noise if it becomes loose. Clicking can also happen if soot or grime builds up on the fan blades. It’s best to let a professional deal with cleaning or calibrating the fan, especially if the furnace is still under warranty. Worn motor bearings: The bearings in the furnace’s motor will click when they become worn. Leaving the issue unaddressed will cause the motor will burn out. Gas valve problems: If the clicking sound doesn’t seem to have a pattern, it could indicate an issue with the gas valve. The fix is a home meter replacement, a repair that must be completed by a professional from your gas company, as required by law. Pilot light problems: With time, pilot light assemblies become loose, bent, worn or dirty, preventing the pilot light from functioning properly. The clicking noise could be an issue with the system’s wiring, a broken flame sensor, ignition problems, gas issues or a faulty pilot. Call a certified Portland furnace repair specialist quickly. Replace the air filter: If more than a month has passed since you last changed the furnace’s air filter, now is a good time to replace it. Dirt and debris trapped within the filter might be restricting airflow, causing the furnace to overheat and trigger the safety control, or limit switch, to turn off the burners. As a result, the blower continues to blow cool air to cool down the furnace. Ignoring the air filter and repeated overheating will damage the heat exchanger, leading to an expensive repair. Verify the thermostat settings: If your home seems warm, but you feel cool air blowing from the registers, look at the thermostat’s settings. Verify that it’s set to “Auto” instead of “On.” When the furnace is on the “On” mode, it will continuously blow air, even if it’s not heating the air. Pilot light problems: Relight the furnace’s pilot light if you notice that it’s out. If you don’t feel comfortable doing this task, call a specialist.If the pilot light is out and refuses to light, gas might not be flowing into the furnace. Verify that the gas valve switch is at the “On” position. If it is on, the pilot light might be dirty. If this is the case, contact your HVAC specialist for advice on cleaning it. Pilot light doesn’t remain lit: If pilot light troubleshooting tips do not work and the flame doesn’t stay lit, the thermocouple may need to be adjusted or replaced. Ductwork leaks: When ductwork has holes, it will send warm air into unoccupied spaces of your home, such as the attic or crawlspace. Similarly, cold air from the unoccupied spaces might enter the ductwork and blow into your home. A duct inspection and repair will remedy the problem. Clogged condensate drain lines: High-efficiency furnaces have condensate drain lines that remove water during the heating process. If the line becomes clogged, it can trigger a safety feature that keeps the burners from lighting. If your high-efficiency furnace has a leak, the culprit is generally a condensation leak. The unit extracts heat from combustion gases using two heat exchangers, causing the gases to cool and condense. A condensate drain directs the water out of your home. If it pools around your furnace, the condensate drain or tubing may be clogged or broken, or the condensate pump might need to be repaired. Leaks may also be the result of a whole-house dehumidifier leaking into the furnace or the installation of an incorrectly sized flue pipe. Because many of the common problems furnace owners experience can be prevented with a tune-up and inspection, it’s wise to schedule fall furnace maintenance with a specialist from AAA Heating & Cooling. Whether your furnace is acting up or needs a tune-up, our specialists are standing by to help. Contact us to make an appointment today.